Breast Cancer Awareness should be spread year round. Our Personalized tote bags provide a great way to share Breast Cancer Awareness while going to the library, dropping the kids off at school or heading the mall. 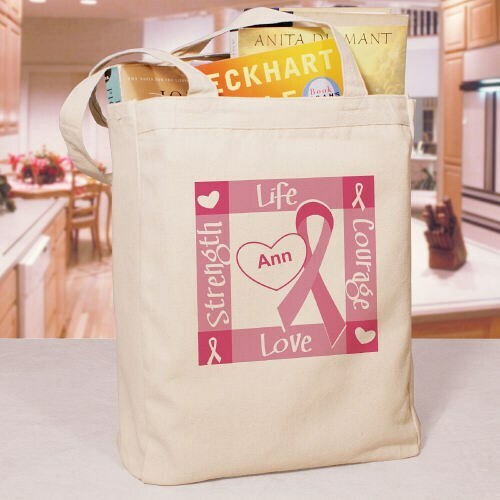 Our Personalized Ribbon of Heart Breast Cancer Awareness Canvas Tote Bag is a 100% cotton Canvas Tote Bag measuring 16"h x 14"w. This tote bag is made especially strong to hold all your take along items. Includes FREE Personalization! Personalize your Tote Bag with any name. Your Breast Cancer Awareness Tote bag is a great gift. Show your Support while using this tote bag at the grocery store. MyWalkGear.com has many great Personalized Tote bags for Breast Cancer. MyWalkGear.com has additional Personalized Breast Cancer Shirts and Walk Gear for your special gift giving needs. Each time a gift is purchased from our Breast Cancer Awareness line of personalized gifts, MyWalkGear.com will make a donation of 15% of the purchase price to help in the fight against breast cancer.